2013 Sightings: June 17, 10 a.m. and 2 p.m. 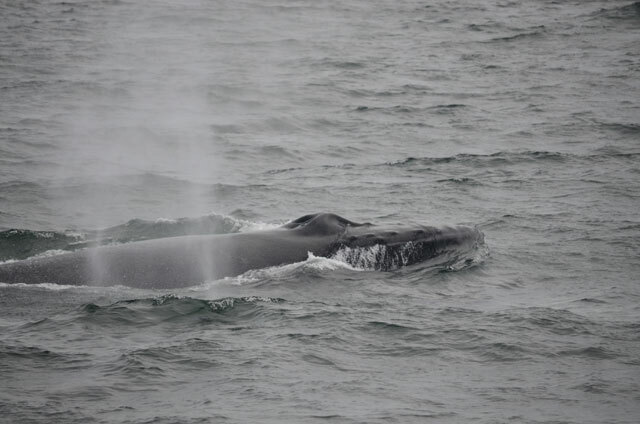 This afternoon on the Cetacea we headed back up north to the southern edge of Jeffrey’s Ledge and found Satula. He was only surfacing for a few short breaths before diving again, but luckily he did not surface far away from us so we were still able to get some great looks at his enormous body, dorsal fin, and fluke! Overall, it was a fun trip that concluded with lightning and hail as we arrived back in Boston. On the Asteria this morning, we headed up north off the coast of Cape Ann. We searched around for quite some time but only found a few minkes that popped up for one breath and then disappeared. We continued back down south along the western edge of Stellwagen Bank but unfortunately could not find anything. All passengers were issued rain checks; however, they did get a gorgeous, sunny boat ride out on the North Atlantic. 2013 Sightings: June 29, 12 p.m. and 5:30 p.m.
2013 Sightings: June 29, 9 a.m. and 2 p.m.
2013 Sightings: June 29, 10 a.m. and 3 p.m.
2013 Sightings: June 28, 10 a.m. and 2 p.m.
2013 Sightings: June 27, 10 a.m. and 2 p.m.
2013 Sightings: June 19, 12 p.m.
2013 Sightings: June 15, 3 p.m.
2013 Sightings: June 14, 2 p.m.
2013 Sightings: June 14, 12 p.m.